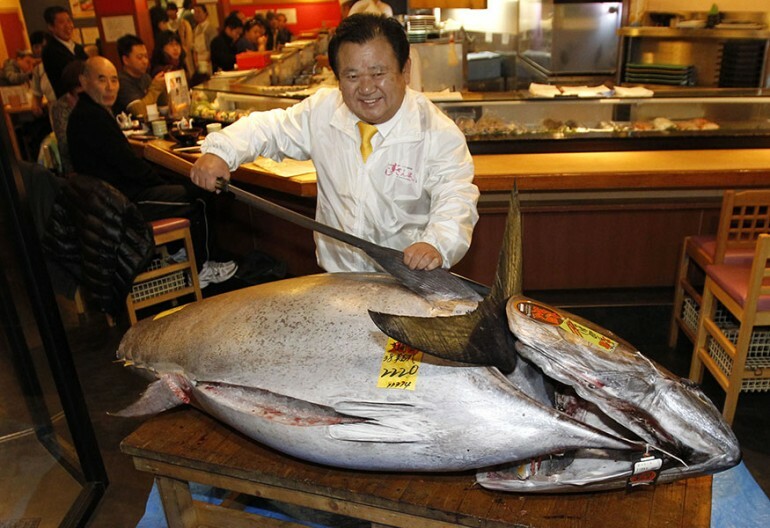 Around this time every year we see huge bluefin tuna auctioned off to the highest bidder in Tokyo’s Tsukiji fish market, and every year they set a new record (no doubt due to overfishing). This year the bar has been set at $1.7 million dollars, that’s more than 4 times the record from last year by the way. And the tuna sold is nearly 50 kilograms lighter than last years! The prices do not necessarily reflect quality or size and are more linked to publicity and setting the tone for the business year. He said he wanted to “encourage Japan” with his bid. The price works out at about $7,600 per kg ($3,500/lb). Japan consumes more than half of the world’s bluefin catch. Wow that is incredible for sure. Only problem is that folks who don’t know tuna fishing, now assume that I make a million bucks every time I catch a tuna! LOLI think the high price is more of a marketing ploy than anything else. Albeit, a very effective marketing ploy. Look at all the publicity this is getting around the world – absolutely amazing. He is one smart sushi restaurateur!